Weekly publication of public filings for Smith County, Texas. Published every Friday - 50 issues per year. 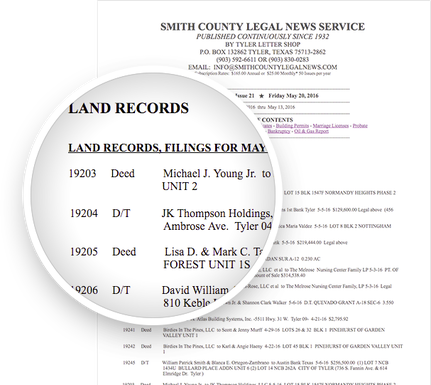 Published in Smith County Texas for 84 years the Smith County Legal News Service provides current data and filings for local, regional, and national businesses. Lending institutions, banks, insurance companies, attorneys, CPA’s and builders. A variety of small business owners and industries along with private individuals have enjoyed keeping up with what is happening in Tyler and all of Smith County since 1932.